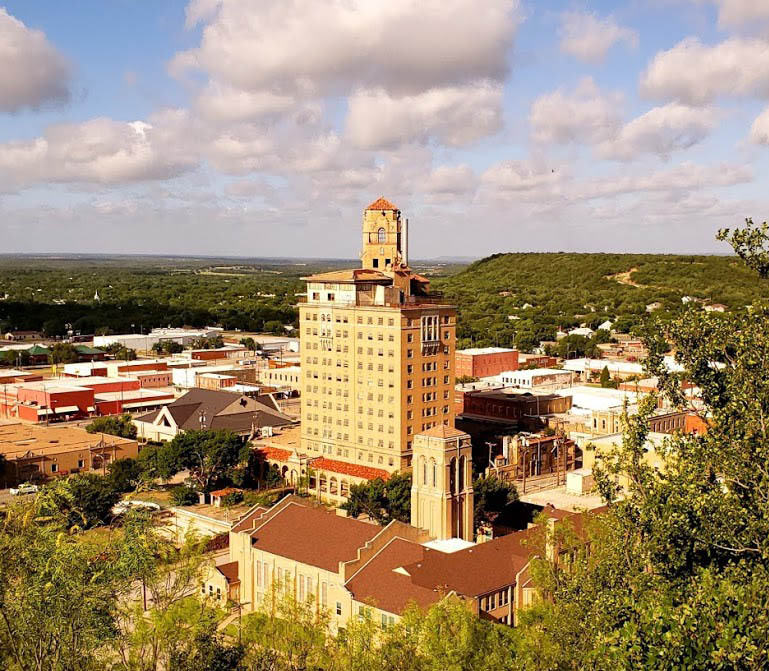 Take a walking tour around the famous Baker Hotel in downtown Mineral Wells. The Baker Hotel has been shuttered for many years, but visitors can enjoy the walking sign tour that was recently installed alongside the street level of The Baker Hotel. Conceived during the Roaring Twenties, the Baker Hotel opened in 1929 as a resort destination. This “Grand Lady” of Mineral Wells was built by T.B. Baker and designed by prominent Texas architect Wyatt C. Henrick. The hotel was constructed to take full advantage of the town’s famed mineral waters. The Baker, which was modeled after the Arlington Hotel in Hot Springs, Arkansas, cost more than $1 million to complete and guests enjoyed a lavish grand opening on November 22, 1929. For more than 25 years the Baker reigned as one of the country’s most glamorous hotels. Consisting of 14 floors and 450 rooms, the Baker offered the finest in resort-hotel services. The entire second level was reserved as the bath and massage floor. Services offered at the Baker consisted of a doctor’s office, mineral baths, steam rooms, salt rubs, hot packs, manicures, and facials. A number of the treatments the Baker offered were prescribed by doctors and were believed to cure everything from rheumatism to eczema. Other amenities included a private club complete with fine dining and dancing, a drug store, upscale boutiques, a beauty salon, a barbershop, and babysitting services. Another big draw for the Baker was the variety of big-name entertainers offered nightly at the hotel. Names like Herby Kay, Paul Whiteman, and Lawrence Welk all graced the Baker’s stage a time or two. On the coattails of these great entertainers came great audiences, which almost always included a famous face. Some of the famous names to appear on the Baker Hotel guest list include Judy Garland, Clark Gable, the Three Stooges, Lyndon Johnson and Lady Bird, Roy Rogers, Will Rogers, Marlene Dietrich, Mary Martin, General Pershing, Dorothy Lamour, Sammy Kaye, Jack Dempsey, Helen Keller, and Ronald Reagan. A local legend also contends that Bonnie and Clyde stayed in the hotel on one occasion under an alias. The building was in constant use from 1929 to 1963, including a three year period during World War II in which it served as military dependent quarters. The building sat vacant for two years until 1965, when a group of Mineral Wellians re-opened the Baker, but it would not last. The mid-1960s ushered in a time of change for the nation and resort travel was at a steep decline. The American lifestyle had changed throughout the years and it was because of this and other factors that the Baker ceased operation as a hotel. The Bakers ground floors were utilized by merchants for a few years longer, but eventually the majestic hotel succumbed to the changing times. Its doors were locked in 1972 and the Baker quickly began to deteriorate. Ten years later, in 1982, The Baker Hotel was placed on the National Register of Historic Places. Throughout the years there have been many inquiries about the depleting hotel. None were serious until 2008 when a group of developers led by Laird Fairchild of Hunter Chase Capital Partners in Southlake took interest in the hotel. Fairchild and Chad Patton, another partner in the renovation process, have found a way to finance the renovation through an elaborate series of funds including grants from the Environmental Protection Agency, the Historical Commission and federal and state tax credits. Another major source of funding is from the EB-5 visa program, where international investors can receive temporary residency by investing $500,000 in a U.S. business. 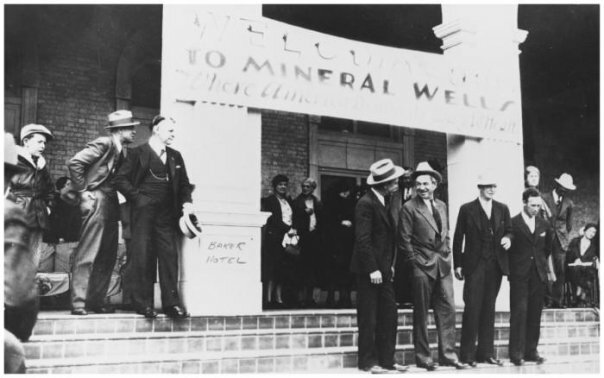 The residents of Mineral Wells have been called upon to invest in the Baker Hotel. In May 2014 the citizens of Mineral Wells voted to implement a 4B economic development sales tax to accumulate $4 million. One-eighth of a cent of the city’s sales tax will be reallocated to the Baker Project. If all goes smoothly, securing the funding for the project, the renovation could begin as early as 2018. In 2017, Leadership Mineral Wells 24, a civic and personal leadership organization, set out on a mission is to raise funds to replace the plywood and old broken windows along the street level of the Baker Hotel block. The project would involve removing the old deteriorated plywood pieces and reframing 42 windows and installing new informative signs that tell the history of The Baker Hotel and the city of Mineral Wells. In June of 2018 that mission was realized. 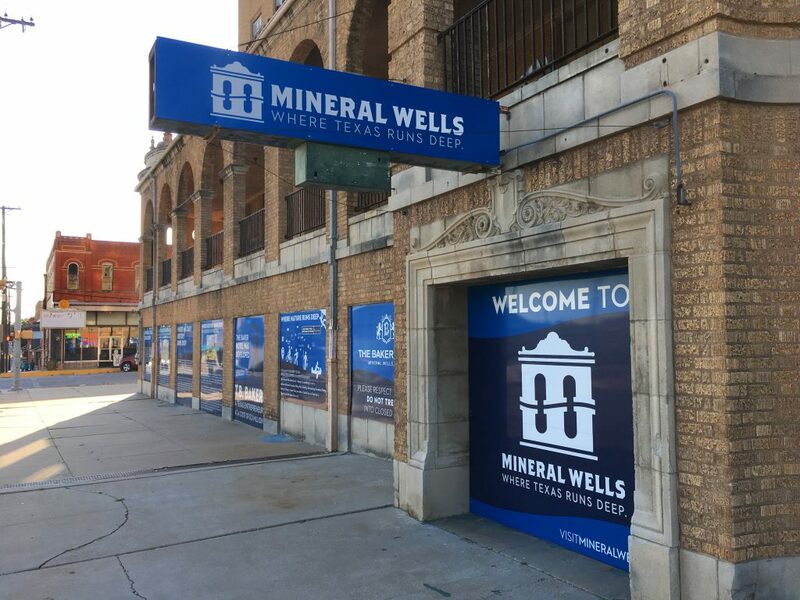 Visitors to The Baker Hotel can now stroll along the street level and read about the attractions and history of Mineral Wells and The Baker Hotel. So, next time you’re in town, make sure you stop by the “Grand Lady” of Mineral Wells.